Here is a list of 20 best free WebM player for Windows. These can play WebM videos downloaded from internet. Here you will learn how to play WebM file and how to open Web file using these media players. It will also introduce you to all basic and advanced features of the listed WebM players. These WebMplayers can also play many other video and audio formats, such as MP3, MP4, MPEG, FLV, MKV, MOV, etc. These players have basic options to play, pause, stop, open forward, backward, control volume, seek video, etc. Some of these WebM file players have some advanced features as well. These options let you create playlist, add subtitles, download subtitles, resize video, convert videos, crop a video, play online videos, play Radio, video output control, etc. Some let you play audio and video from YouTube, Dailymotion, Lego City, Fox News, Vimeo, etc. Check out the details of listed players below and use any of them to play WebM Videos on PC. WebM is one of the video formats which is mainly designed for web. It consists of compressed stream video and compressed stream audio files. If you download any files with .webm extension, then you might need a media player designed to play such files, because all media players cannot play these. These WebM players listed here enable you to play videos downloaded from YouTube, Dailymotion, Google and other websites. Free WebM Player is one the best freeware to open WebM files. Its clean interface lets you watch your favorite WebM videos clearly with all basic playback functions. It supports other media formats as well. You can also use it to upload audio and video files on the internet. Check out some other articles on List of Best Free Media Players, Best Free Blu-Ray Player Software, and Best Free Internet Radio Player. Free WebM Player is a free media player which is dedicated to play WebM media files. It has very simple but friendly interface with minimal but enough playback options. You will find Open, Play/Pause, Forward, Rewind, and volume control buttons along with a seek bar. It also supports other media formats, such as: MP4, FLV, MOV, MKV, etc. You can use it to upload audios and videos on web. Apart from these, you can Resize, crop, add special effects, control volume, and rotate a video if you like. Kodi is an open source media player, which can be used to play WebM files. The main interface has options to open Videos, Music, Pictures, Games, and other media files. It can also plays TV serials and series. You can create playlist of videos and audios. It can import Images, save in library, play slideshow, and apply filter. You can watch and record Live TV as well. It supports many famous backends, like: MythTv, MediaPortal, NextPVR, VDR, etc. It incorporates UPNP which enables you to stream media files on other devices through this player. Apart from these, there are many Add-ons available for this WebM Player which can enhance its features to access more videos and audios. It is a multiplatform WebM player for Windows, Linux, iOS, and Android. FVD Player is another free and simple media player. It can play lots of media formats, along with WebM media files. It simply lets you browse and play WebM files from your PC. You can create playlists and add subtitles. You can find some more options in drop down list available on the top of the interface. These options let you control color, access equalizer, zoom, toggle to full screen, etc. Stay on Top keeps this WebM player on the top of all running applications, so that you can watch videos while doing other jobs. It supports many other media formats other than WebM, such as: MP3, MKV, FLV, MP4, AVI, etc. ALLPlayer is a free WebM media player. Open icon lets you open video files, audio files, CD/DVD, URL, Movies from internet, and audio CD. You can add subtitles, edit screen view, control audio equalizer, control sound effects, etc. As the name suggests, it can support almost all media file formats. Supported formats are: MP4, WMV, MPEG, MPG, 3GP, MP3, MKV, DivX, M2TS, XviD, MOV, RMVB, etc. Compatible Windows: Windows 10, Windows 8, Windows 7, Windows Vista, and Windows XP. Play Puzzle game on VLC. Control VLC using mouse gestures. Stream media files between Android and Windows. Record desktop screen using VLC. Set a video as desktop wallpaper. Ace Media Player is a simple and free WebM media player. It lets you easily play WebM files. It consists of few buttons, which let you pause, play, control volume, rewind, and forward easily. Seek bar and a button to eject CD/DVD drive is available on the UI. Apart from WebM format, it supports many other media formats as well, like: MP4, MKV, WMV, AVI, MPG, RMVB, MOV, FLV, TP, TS, etc. Winamp is a popular, albeit old media player. Its popularity has been due to its small size, and wide range of support for different media formats. So, it comes as no surprise that it is a good free WebM player as well. You just have to browse and add WebM files in playlist. Select and play any of the WebM files from playlist. You can use play/ Pause/Stop buttons while watching. Options for display and video playback are available. These let you watch WebM video in Normal size, Half Size, or Flip frame vertically or horizontally, etc. Its interface is divided into sections for different tasks. These will help you to search albums from local drives, show playlist, monitor played media, play media, etc. It easily lets you access Media Library. It comes with options for Visualization, open different media from local files, folders, URLs, Library, etc. Also, you can view file info, bookmark, control playing options, change skin, control equalizer, enables notifications, etc. Compatible platforms: Windows and Mac. Awesome Video Player is a free WebM player. You just have to drag and drop a WebM files to play. What separates it from the rest is that its one of the few free WebM Player to play multiple WebM videos together. You can play multiple WebM files by repeating this drag and drop method. It can play a maximum of 16 WebM videos at a time. You can find a collection of Hotkeys to handle this video player easily. It supports most of the media formats, such as: MKV, AVI, 3GP2, 3G2, 3GPP, WMV, FLV, MP4, MP4V. M4V, MPEG, MPEG2, DIVX, MPEG4, M2TS, etc. Supported Windows versions: Windows 10, Windows 8, and Windows 7. VSO Media Player can open WebM files along with other audio and video formats. There’s also an option to open BluRay and DVD here. Open a WebM file to view it. Image settings let you change Brightness, Contrast, Saturation, Gamma, and orientation of WebM video being played. Seek bar and playback options are standard buttons available. You can also create playlist of your favorite media files. Option for Subtitles is also available. Supported Formats: MOV, WMV, MTS, M2TS, ISO, 3GP, MPG, DIVX, AVI, MP3, WAV, MPU, FLAC, APE, XVID, TS, AAC, CLP, OGG, RAM, TIVO, AC3, DTS, XVID, MKV, etc. Free AVI Player is a free WebM player, where you can open a WebM file. There are also options to open CD/DVD and recent files. It has options to control audio and video settings as well. You can play WebM videos in different screen sizes, like: Normal, Half, Double, etc. Here you will find some tools to change Skin, Language, Effects, and Preferences. Supported Platforms: Windows and Mac. Supported Windows: Windows 10, Windows 8, Windows 7, and Windows Vista. Starbuck’s FreePlayer is a free media player to play WebM files on PC. It can play ISO, Blu Ray Disc, DVD, and Folders. It can also play media files from a network using protocols like: FTP, MMS, HTTP, RTP, etc. It lets you browse and play internet media files. You can play media from Dailymotion, YouTube, Music Addict, Lego City, Fox News, CBS news, etc. You can save media from network to a local disk or folder. It supports subtitles in many languages. It can play many formats of audio and video: MKV, WebM MP4, WMV, DTS, AC-3, MP3, MPEG-2, FLV, AAC, Xvid, Divx, etc. It is cross-platform software available for Windows, Mac OS X, and Linux. 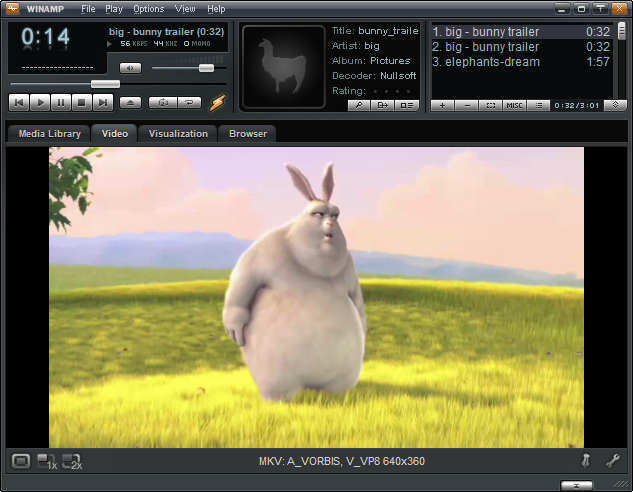 HUPlayer is a free media player which can play WebM files as well. Browse, select, and play a WebM file. It can play HD video as well. Seek bar, options to play, pause, next, previous, stop, and control volume are available on the UI. Its an elegant looking media player with minimal options. It can play almost all popular media formats like: FLV, AVI, MP3, 3GP, MPG, RM, AAC, WMA, ASF, WMV, OGM, MKV, AC3, AMR, ALAC, RAM, DTS, MOV, OGG, NUT, etc. Compatible Windows: Windows 10, Windows 8, Windows 7, Windows XP, Windows Vista, Windows 2003, and Windows 2008. It is a multi platform WebM Player, available for Windows, Mac, iOS, and Android. 5KPlayer is free player to play WebM files. It provides a simple but awesome interface to play video and audio files. You can easily open a video file through Open video option or use Drag and Drop method to open a media file. It can also play DVD and Internet Radio. This WebM player has a Library section where you can save different audios and videos in classified groups. When you play a media file, it will automatically save that file. You can also create playlists here. It can play HD videos of 4K, 5K, and 1080P resolutions. Stream videos in AirPlay and download videos from Vimeo, Daily motion, YouTube, etc. It supports many other formats, such as: MPEG, AVI, MP3, DVD, 3GP, Blu-Ray, AAC, FLAC, APE, etc. UMPlayer is a free media player. Its full name is Universal Media Player and true to its name, it can play almost all media formats. And WebM is one of the supported formats. It can open audio and video files from local folders, directory, DVD, VCD, radio cards, YouTube, SHOUTcast, etc. It incorporates of about 270 inbuilt codecs for audio and video playback. Usual playback options, including equalizer, seek bar, volume controller, play/pause buttons are available on the UI. Support for subtitles and other tools make this a good media player. Supported formats: FLV, XVID, WMV, WMA, MOV, MP4, MP3, MPEG, AVI, DIVX, H.263, WAV, Vorbis, VOB, Matroska, RealMedia, ASF, AAC, AC3, OGC, QT, etc. Cross-platform: Windows, Mac Os, and Linux. Add, share, and download subtitle files. Rotate video in different angles for a better view. Change and download skins or logos. Inbuilt audio and video codec. If some of them are missing and cannot play a file, you can download that codec directly from here. Play media of various formats, like: MP4, AVI, MOV, MKV, FLV, WMV, etc. Cross platform: Windows, Android, and Apple. SMPlayer is a freeware which can play WebM audios and videos. You can simply open a WebM file through Open icon. Or, Open menu lets you browse recent files, favorites, directory, playlist, Disc, URL, TV, and radio. It has codecs for audio and video files which enables it to play almost all media formats. Simple and basic playback options including seekbar and volume controller is available on the interface. Change audio/video playback settings. Add subtitles in various languages. Resume features lets you enjoy a video from where you left last time. Search, download, and add subtitle files. Supports multiple platforms: Windows and Linux. Available for Windows versions: Windows 10, Windows 8, Windows 7, Windows XP, and Windows Vista. IQMango Media Player is another good media player which can play WebM files. It is a simple player, with only basic media player options. Open a WebM file or you can open multiple files as well. The interface has options to control media playback through a seek bar, play/pause button, next, forward, shuffle, repeat, volume key, and fullscreen toggle button. It supports a good amount of media file formats, including audio and video. Aun Player is a free WebM player for Windows. It is a versatile media player which lets you open various video file formats including BD/DVD ROM and BD/DVD folders. The interface has a seek bar, playback options, fullscreen toggle button, and options to select video track, audio track, and subtitle. A separate button is available which enables you to eject CD ROM directly from the player. Media Cope is a free webM player. Use Open button to open and play any audio and video from files, DVD, and VCD. All necessary playback options are available on the interface. Create playlists of your favorite media and play continuously. You can also take screenshot of a video while playing. Keep on Top option lets you watch videos on top of all application while doing other jobs. It is a combination of Audio player, Video player, Audio Cutter, Video Cutter, Audio Joiner, Video Joiner, Audio Converter, Video Converter, Photo Cutter, Photo Resizer, Photo Converter, and Slide Show Maker. It also supports many other audio and video formats other than WebM, like: MP4, MPG, MKV, FLV, MP3, WMA, AAC, DAT, VOB, AVI, WMV, RMVB, MOV, DIVX, FLAC, 3GP, etc. Zoom Player is another simple Webm player available for Windows. It is simple and easy to use, just like any other media player. To open a Webm file, right click on the interface, then choose the Open option from the context menu. You can also open several other video and audio formats here, along with online videos, CD/DVD, etc. Load a subtitle if required. Equalizer option lets you change audio output. The extended menu lets you control video output by changing brightness, contrast, color, etc. Load or create a playlist if required. You can also change player skin according to your choice. MPC-HC is stands for Media player Classic-Home Cinema. It is an old media player which can play WEbM files. It has options to open files, DVD, BD, Device, Directory, and Recent files. You can play WebM videos and control it with some basic playback options. You can use play, pause, stop, rewind, forward, volume controller, etc. It lets you add subtitles, control rate, control audio tracks, control video tracks, set as favorite, etc. It is a good DVB player as well. Supported Windows Versions: Windows 10, Windows 8, Windows 7, Windows XP, Windows SP3, and Windows Vista. DVDFab Media Player is a free media player to open WebM files. It can open files or Disc folders. Here you can make use of play, pause stop, back, forward, and volume controller buttons. Playlists can be created and you can play added items consecutively or in shuffle. This media player can also Flip and Rotate WebM videos. It can play UHD, HEVC, and 4K videos. Compatible Windows Versions: Windows 10, Windows 8, Windows 7, and Windows Vista.